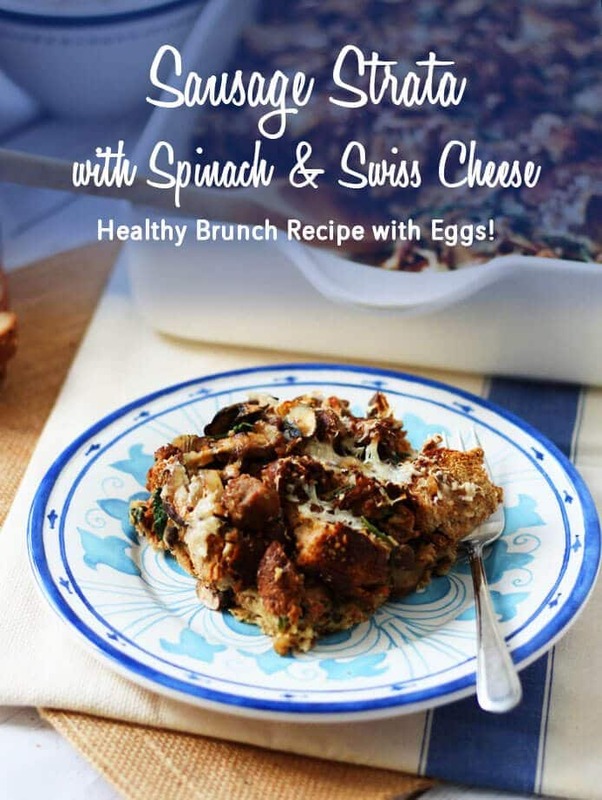 This Sausage Strata with Spinach and Swiss Cheese has a perfect balance of protein from eggs and high fibre carbs to make brunch entertaining easy and healthy! And yes, I’m human so that means I often don’t want to leave the house in the cold to get groceries (if it doesn’t fit in my arms on the way home from another errand, it’s probably not happening.) So that’s why I am kinda obsessed with these super easy whatever-you-have-in-the-fridge recipes for easy and fast meals. Strata is no exception. Strata is a traditional brunch dish made with a combination of baked eggs and day old bread. It’s always been something I make when I’m in a super pinch and need to get something on the table STAT and trust me, no body ever minds. 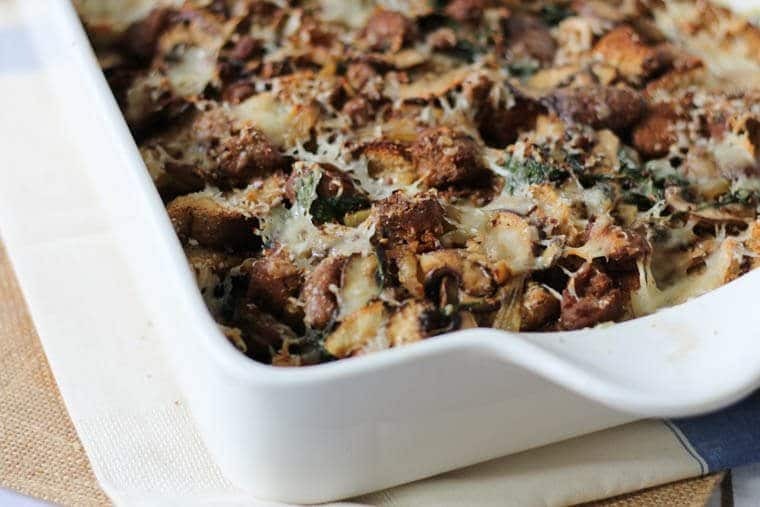 This Sausage Strata with Spinach and Swiss Cheese is made a bit more dinner friendly by throwing in some extra savoury vegetables and hearty turkey sausage. 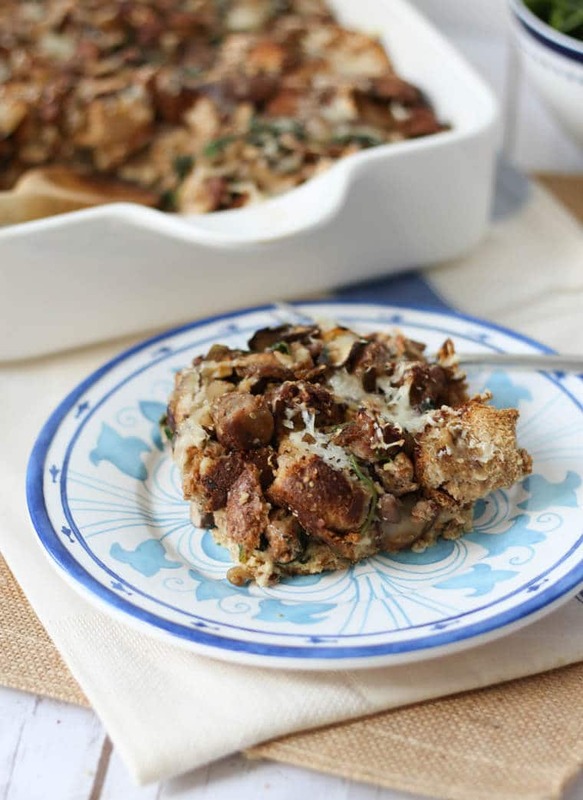 Sausage strata is like if holiday stuffing and quiche had a love child and named it something sassy. Sta-ta. Cha, cha, cha. It sounds like a dance move so I just like saying it. (I know you’re saying it in your head a lot too). So this sausage stata recipe can easily be mucked about with to add in whatever your favourite ingredients may be. 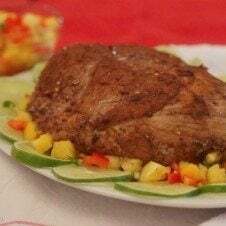 If you’re having guests over, this dish can easily be made ahead and simply rewarmed covered in tin foil at 300 F for 15 minutes. It’s easy, light, and protein packed- perfect for keeping us warm during these blue winter times. What are your favourite strata add ins? 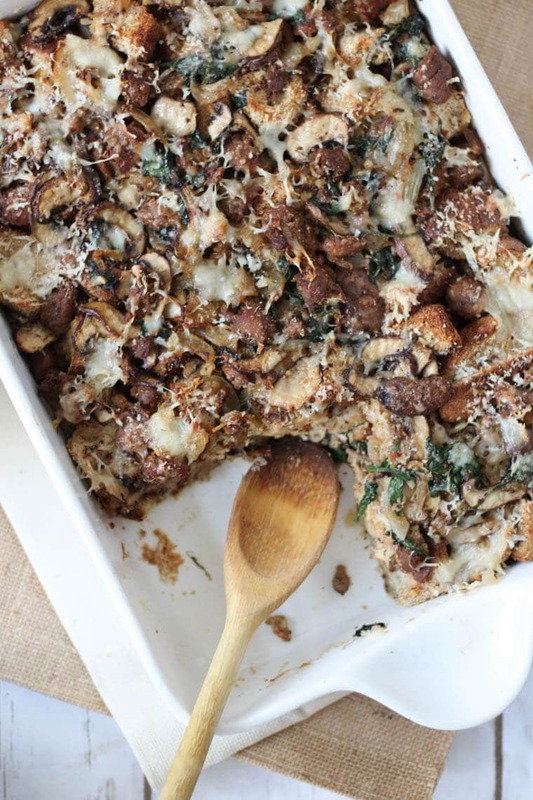 Have you tried this sausage strata? Leave me a comment below with your thoughts and suggestions! Lightly grease a 9x13 inch casserole or gratin dish. Add a teaspoon of oil to a large nonstick skillet over medium high heat, and add in the sausage. Saute until the meat browns and is broken into small bite-size pieces, about 7-8 minutes. Remove the sausage to a bowl and set aside. Return the pan to the stovetop and add in the additional 2 teaspoons of oil. Add in the onions and cook on a medium low heat until golden brown, about 30 minutes. Add in the mushrooms and savory, and sauté until the mushrooms begin to brown, about 5 minutes. Then stir in the garlic, and stir for 1 minute before adding the spinach and the cooked sausage. Saute until the spinach begins to wilt. Season with salt, pepper and nutmeg and set aside. In another bowl, mix together the eggs, milk, mustard and a pinch each of salt and pepper. 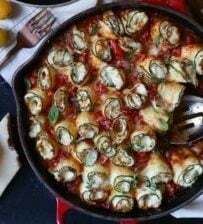 Arrange half of the bread into a casserole dish, then add in half of sausage mixture, half of the eggs and half of the Swiss cheese. Repeat with the bread, sausage, eggs and cheese again. Finish with the parmigiano reggiano. Cover and refrigerate for 1 hour or up to overnight. Bake uncovered for 40 min or until golden brown. Enjoy warm. Previous Post Pistachio & Tahini Protein Smoothie | Gluten Free, High Protein Breakfast Recipes! Oh this looks so good. 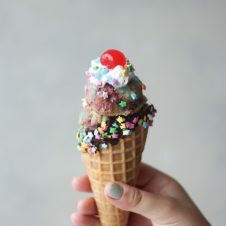 I pinned it and cannot wait to try it! YOU always have me drooling. ALWAYS! Now I really want some sausage. Ha Ha Ha! Anddddd that came out – RIGHT! I love when there are healthier options at brunch! This looks delicious, Abbey! I have a big gorgeous loaf of whole grain brain that I need to use up and this looks perfect! Love the mushrooms in there. yesss you need to use it up! This looks so good. I actually grew up on something like this. Brings back great memories of my grandfather in the kitchen. I love these type of egg recipes. They are so versatile and healthy. And easy and fast. Can’t forget easy and fast. I am alllll about a healthy brunch! Great recipe! I’ve never tried a strata, but this looks amazing and I have some bread that I need to use up and this would be perfect! exactly! i have a baguette right now! 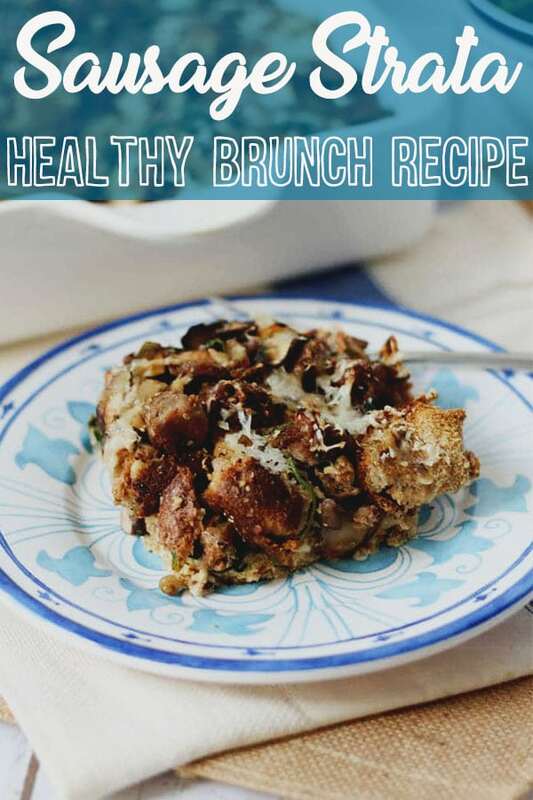 this sounds like a wonderful brunch idea..i make frittata often but didnt think of strata. love it. My husband would love this and it looks so savory and packed with flavor. I may have to whip this up for him and my dad next weekend when we’re up at my parents. oh yes! men love this! 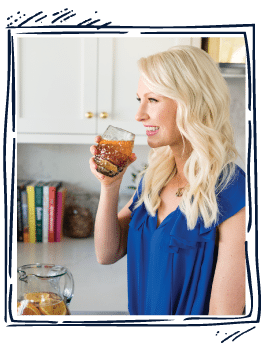 I know my husband would LOVE this recipe so I’ll definitely be bookmarking it! Gorgeous photos as always, Abbey! 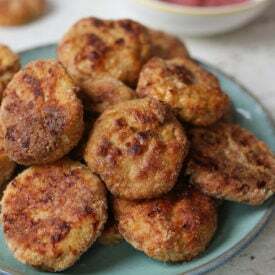 This looks like the perfect party brunch food! OMG this looks so so so GOOD and the perfect comforting brunch for a cold winter day! 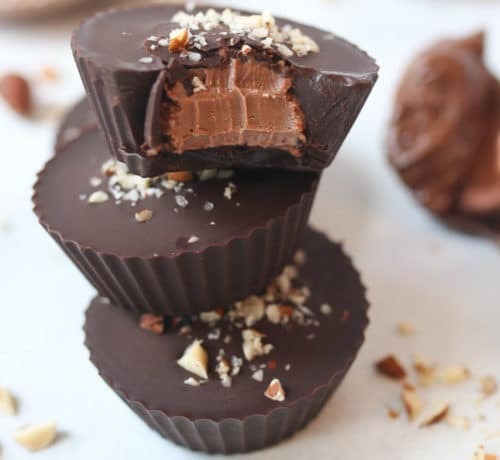 I agree with Gigi that this probably makes your kitchen smell DELISH! DELICIOUS!!! 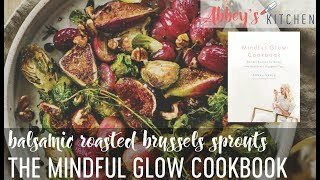 Sounds like a flavor explosion and I bet your kitchen smells utterly phenomenal when this is baking!